Design of funnel permits addition of solvents to flash chromatography columns without disturbing the silica-gel/packing layer. 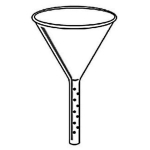 Lower end of the funnel is closed and the stem has a series of small holes through which the solvent drains. 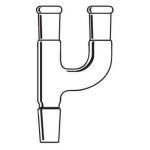 Top of the funnel is 75mm (3in) in diameter with the stem size as listed. Stem OD 22mm. Stem length 75mm. Stem OD 28mm. Stem length 100mm.